It seems that bold font is a good way forward and a good compromise, and all of the single sideways patterns have now been reformatted! The bold doesn't show so well with the cable symbols, but it's certainly something I'm going to continue to do. I'm glad I asked for feedback, it's been incredibly helpful. When I look at the charts in Going Straight now I cringe a little - they aren't what I envisaged, but it was my first book and charts were relatively unknown territory to me. Having taught myself now better ways of creating them, I feel much happier about moving forward. Having said that though, I've never had a complaint about the way the symbols are used in GS, so I'm not going to get myself worked up into a worry stupor and panic to get them reformatted. I'll start with the ones that are available individually through PatternFish, and do the remainder as and when time permits. I want to outsource these but my budget won't let me right now. Right. Since we've been back in the UK we've been running aorund all over the place, and have barely had time to sit still and catch up with what we've done! We haven't had internet access everywhere we've been, and even here at my Dad's I can't get online all the time so it's been difficult to blog about our travels.. and when we do have access, work things take over (I still owe some emails). This morning I've a bit of time and I want to share photos of new yarn that I've picked up along the way, I kinda like remembering places I've been through the yarn I've acquired ;) The least I can do is show pictures of pretty yarn to make up for my poor blogging, no? Whilst myself and Aran were in Sheffield a couple of weeks ago visiting my mum (Tom was in London working) we popped up to see the lovely Susoolu in Hull. We hadn't seen each other since Woolfest 2007 (!) and a catch-up was long over due. Whilst there, we fondled yarn, flicked through knitting books and talked woolly stuff. As you do. She then told me to take all this Shetland jumper weight (4ply)! She wanted the space and I'm sure this is her way of hinting about me getting back to designing colourwork. It's all in 25g balls, some colours there are 2 balls, a few 3, but mostly odd balls. I've a fair stash of yarn waiting for Getting Stranded (remember this book title I was banding around a while ago, until it got put on the back-burner?) and this little lot (just over a kilo) will go to join it and wait for me to finish the million and one things on my to-do list. 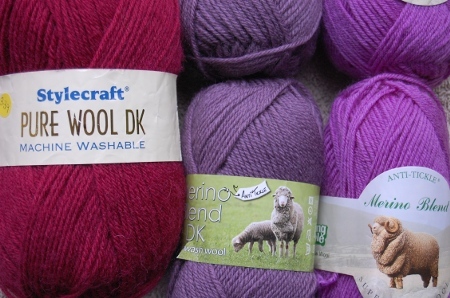 I bought two lots of King Cole Merino Blend (couldn't decide between colours!) 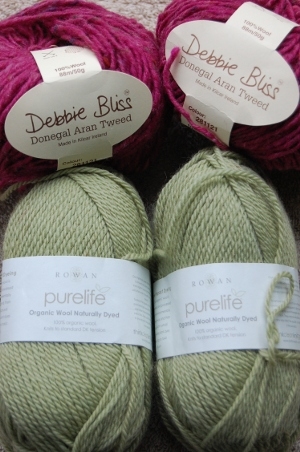 and some StyleCraft Pure Wool DK. The maroon is shown here, but I also got a kahki green which is on the needles, and it's not bad to knit with. It's not quite as soft as the King Cole, and I'll let you know how it washes up after I've done a Hats' worth. It's cheap too, under £3.50 for 100g - bargain! This last one isn't a British yarn, and I didn't quite acquire it on my travels... when we got back from Italy, there was a letter waiting for me from a new yarn company in Uraguay, introducing themselves. Some correspondence later, yarn arrived :) This is a sample that they've sent me, 200g of it, and it is incredibly soft! This is chunky to bulky yarn, a little above my current fave gauge, but there are are ideas brewing for it. It's 95% Merino/Corriedale, 5% Silk, single ply. The company are called Abuelita Yarns, and if the quality of other yarns to come from the same region is to go by, they're going to do pretty well. This most definitely has that Malabrigo softness we're all familiar with, and I'm looking forward to playing with and working on a design. That's it for this morning! If you're waiting for a personal email from me I promise I haven't forgotten you - I will write soon!